The 7th Annual Hawaii Robofest Regional Tournament was a huge success! On Saturday, April 5th, at the University of Hawaii West Oahu campus, over 250 students from grades 4-8 competed in autonomous robotic activities. The event was free and open to the public from 8:30am to 3:00pm. 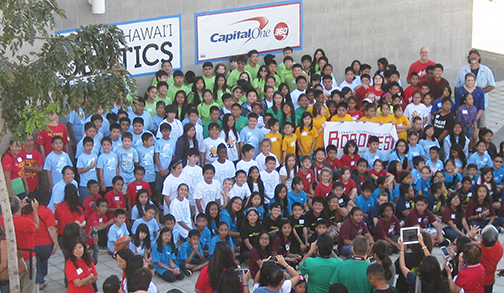 Special thanks to our Sponsors: Capital One Investing for Good Program and the Friends of Hawaii Robotics. We would also like to thank all our Community Partners: Highlands Intermediate School, University of Hawaii at West Oahu, University of Hawaii College of Engineering, Mililani High School, Waikele Elementary School, Honowai Elementary School, Prof. Roger Kwock from Leeward Community College and Flo’s Min Florists. These generous donors provided all the resources to make the Hawaii Robofest program happen. We’d also like to thank all our wonderful Organizing Committee members, coaches, students, volunteers, parents and administrators who work tirelessly throughout the year to plan and prepare for all the Hawaii Robofest activities. Robofest is an international scholastic robotics program created in 2000 by Dr. CJ Chung, a professor at Lawrence Technological University in Southfield, Michigan, to excite students about math. Introducing Robofest to Hawaii in 2007, isisHawaii is proud to be one of its 23 tournament hosts and supports Dr. Chung’s vision and mission.